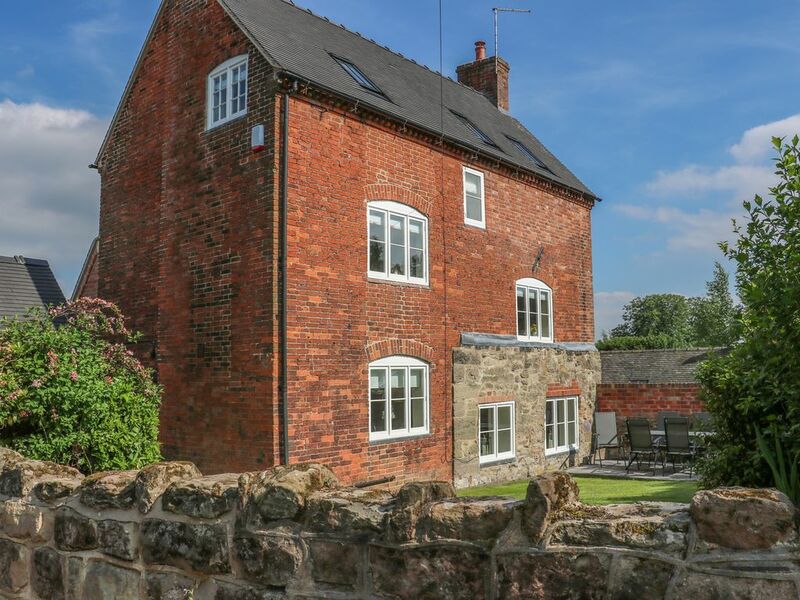 Firtree Cottage is a three-storey house situated one mile from Ashby-de-la-Zouch in Leicestershire. It provides four bedrooms, they include a super king-size zip/link, two king-size and a twin, as well as a bathroom and a shower room, the cottage can sleep eight people. Inside, it also includes a kitchen/diner and a sitting room with a woodburning stove. Firtree Cottage is a classy, tasteful cottage perfect for couples, friends and family wishing to explore the wonderful towns and cities of the area. Amenities: Gas Heating, woodburning stove. Range cooker, microwave, fridge, dishwasher, washer/dryer, Smart TV with Freeview, stereo with Bluetooth capability, WiFi. Fuel, power and starter pack inc. in rent. Bed linen and towels inc. in rent. Cot and highchair available. Off-road parking for 2 cars. Enclosed lawn and patio with furniture. Sorry, no pets and no smoking. Pub 3 minute walk, shop 1.5 miles. Region: The ultimate in “year-round” appeal, the Peak District offers countryside, picturesque villages and magnificent scenery. It touches upon six counties and encloses 555 square miles of open moorland, flowing rivers, and wooded dales. Town: This market town sits in North West Leicestershire, within the National Forest of England. It benefits from a wide range of shops, bars and restaurants as it also boasts attractive castle ruins along with a golf club on the outskirts. Many towns and cities lie in the surrounding area, with Burton, Swadlincote, Loughborough and the striking major city of Birmingham on offer. Over three floors. Four bedrooms: 1 x second floor super king-size, 1 x second floor twin, 1 x first floor king-size, 1 x first floor twin. Bathroom with a shower over bath, basin and WC. Second floor shower room with basin and WC. Kitchen/diner. Sitting room with woodburning stove. Gas Heating, woodburning stove. Range cooker, microwave, fridge, dishwasher, washer/dryer, Smart TV with Freeview, stereo with Bluetooth capability, WiFi. Fuel, power and starter pack inc. in rent. Bed linen and towels inc. in rent. Cot and highchair available. Off-road parking for 2 cars. Enclosed lawn and patio with furniture. Sorry, no pets and no smoking. Pub 3 minute walk, shop 1.5 miles. Had a lovely 3 night stay at Firtree Cottage in Smisby. Accommodation was immaculate and really comfortable- like new! Location was perfect. Really quiet but close enough to town and local amenities. Would definitely recommend this accommodation and would love to return.